Regular readers are probably pretty surprised to see me touting quiche because I've long claimed to be a crust hater. I think I should have clarified. I really only dislike that thick crust edge and when a pie has a top crust. Most people would argue that that's pretty much the whole crust, right? Which is why I always say that I hate crust. But as long as I'm the one doing the cooking, I can make pies or quiches without a top crust and give the fluted edge to Mr. Ninj. Problem solved. So I guess I'm back on the crust bandwagon. Especially with an easy, whirl-it-up-in-the-foodprocessor crust recipe (see below). This quiche, however, is about more than its crust. This quiche has history. 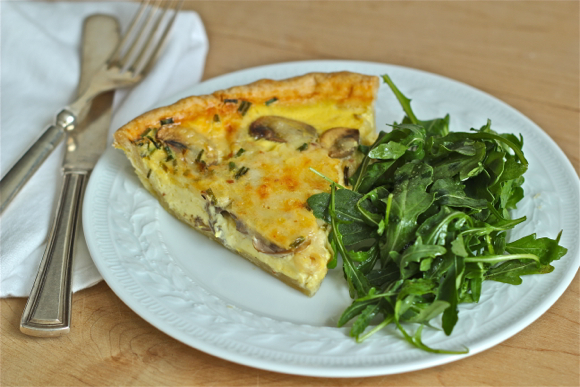 This quiche is one of the first things I ever cooked -- when I was seventeen years old. You've heard my lament before that, while growing up, my mother was not a big fan of cooking yet she didn't want any of us doing it either. She was convinced we'd burn the house down, maim ourselves or, perhaps even worse in her book, make a mess. So it was that I graduated from college and was living in my first apartment before I realized I had no idea how to feed myself (My mother's helpful advice? "Just buy those microwave meals."). The one exception that I remember was this quiche. When I was a senior in high school, I was on the soccer team and we decided to have a end-of-season potluck for the team and our families. While my mom suggested I just buy something to bring, I really wanted to make something, something special. The summer before, my friend Liz, who actually knew how to cook a little bit and was fairly horrified that I barely knew how to boil water, had given me a little notebook with some recipes she thought would be a good starting place for me. I turned to that notebook for an idea for the soccer potluck -- and I found quiche. The quiche was a successful compromise for my mother because the recipe called for a frozen pie crust (no mess, remember?) and the rest was just simple mixing and baking. Result? All I remember is that I overcooked it -- really overcooked -- because I wasn't really sure how firm quiche was supposed to be. I kept testing it with a fork as you would a cake, waiting for the fork to "come out clean." I'm sure that quiche was awful. But I was awfully proud. Fast forward (gulp) 25 years: I still have that little notebook and, while I've modified the bejesus out of the original quiche recipe, I still make it regularly. If you're pressed for time, feel free to use a frozen pie crust. Better yet, when you're not pressed for time, make two crusts and freeze one for later use, because it really is better with a handmade crust. And, if you can, use the vodka instead of the ice water; it achieves the same result but, since the alcohol burns off in the baking process, it yields a flakier crust. The custard is lovely -- rich yet light and just cheesy enough. Also, using the smoky bacon cheddar cheese gives a hint of bacon without weighing down the custard with actual bacon. 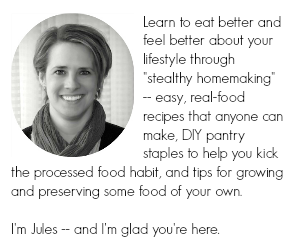 To complete the quiche story, I got back in touch with Liz a few years ago, thanks to the wonder of social media; she's now a trained chef and works for the Food Network. I mentioned the quiche to her and she couldn't remember the recipe at all, so neither of us has any idea of its origin. I have also modified it significantly from the original, including adding my own recipe for handmade pie crust, rather than frozen, so the origin probably doesn't even matter at this point. It will always be Liz's quiche. 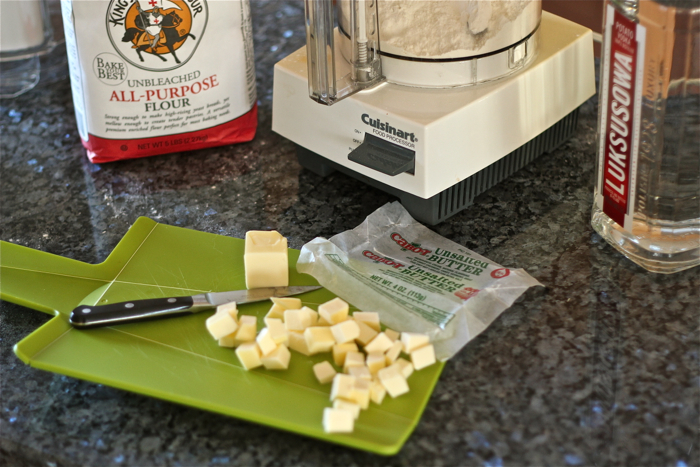 This recipe is a great vehicle for local products: eggs, milk, butter, cheese, veggies. It makes one 9-inch quiche, which serves six nicely. Pair it with a green salad for a light meal. Start by making the crust. Put the flour, butter, sugar and salt in a food processor. Pulse until the mixture resembles coarse sand. Add 3 tablespoons vodka (or ice water) and process until it all comes together into a dough ball (add the last tablespoon of vodka if it isn't coming together well). Shape the dough into a 1-inch thick round, wrap it in plastic wrap and chill it in the refrigerator for one hour. After chilling, remove the dough from the plastic wrap and roll it out on a piece of parchment paper into a 12-inch circle. Transfer the dough to a 9-inch pie plate (I do this by inverting a pie plate on the dough, sliding a thin plastic cutting board underneath the parchment paper and then carefully flipping the whole contraption upside down). 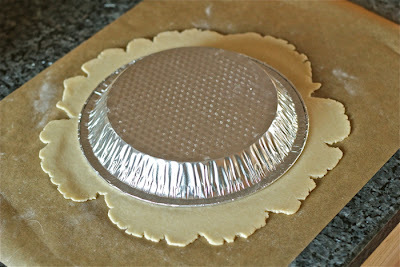 Lightly press the dough against the edges of the plate and trim off the excess dough, leaving about 1/2 inch overhang. Tuck the dough edge under itself and finish the edge (either flute with your fingers or crimp with a fork). Pop the pie plate back into the refrigerator and chill for another 30 minutes. Preheat the oven to 375 degrees. Roughly cover the crust, including the sides, with a piece of parchment paper and add pie weights or uncooked beans to hold it in place (should just cover the bottom of the plate -- don't overdo it). Bake for about 15 minutes then lift the parchment paper and remove it and the weights/beans. Pierce the bottom of the crust a few times with a fork and return it to the oven to bake for about another 10 minutes, or until golden. While the crust is baking, saute the mushrooms in a little olive oil until tender. In a bowl, whisk together the milk, half and half, the 3 eggs, salt and white pepper. 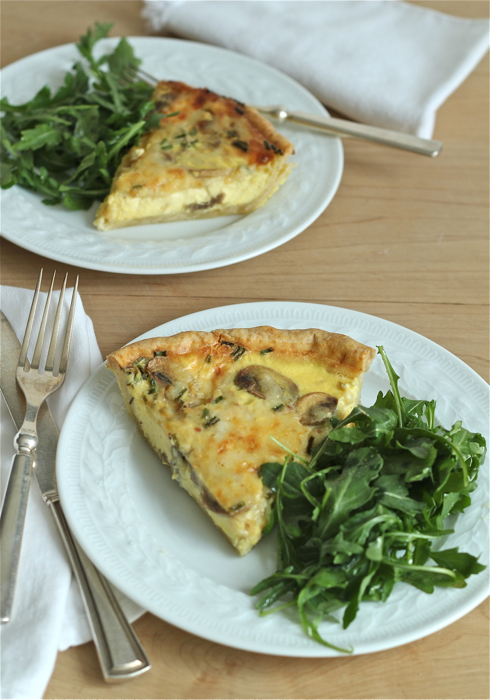 When the crust is finished baking, brush it lightly with the egg white, then add the cooked mushroom, chives and 1 cup cheese in the bottom of the pie plate. Pour the milk mixture over it and bake for 35-40 minutes or until the custard is set and the quiche is golden. Yay for Liz!! And yay for a yummy quiche recipe. Nobody else in my house will eat quiche--any idea if I can freeze it? Yeah, Liz rocks!! You can freeze quiche, if you wrap it up well in plastic wrap and then put it in a ziplock bag. It won't be as good as the first time around, but if no one else but you will eat it, it's worth a try!